Owning your own Home Theater can now become a reality for everyone. 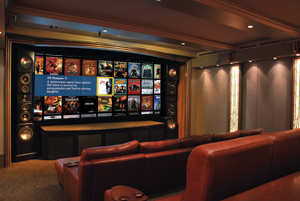 Whether it is finally upgrading your Family Room from the kid’s room with a simple TV and VCR into a multi-channel Audio/Video experience or building a true, dedicated Theater Room, Frankentek Residential Systems can help design, engineer, and build the perfect system to meet your needs and your budget. With so many choices out there it is easy to get confused so Frankentek’s Home Theater specialists will sit down with you to discuss your options and make sure you get the most bang for your money.